Every maker has a story. Be a part of Symmetree Design's story by placing an order, leaving a review, and seeing your review appear here. 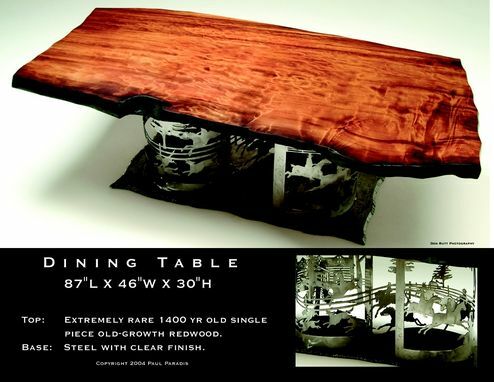 The redwood top on this table is a single piece and museum quality. It is nearly flawless and has an astonishing 1400 years of growth rings in it. The blackened edge is from the tree having lived through forest fires throughout its several thousand years of existence. There are several slabs left out of the series and when gone, cannot be replaced. The steel base depicts a fox hunt scene reproduced from an illustration done for the client. Truly a table for the ages. Top dimensions are: 90" long, 46" wide, and 3" thick.